This morning I attended a service at St. Nicholas of Myra. It was my second visit here; I attended one service last summer, so I already knew most of what to expect. 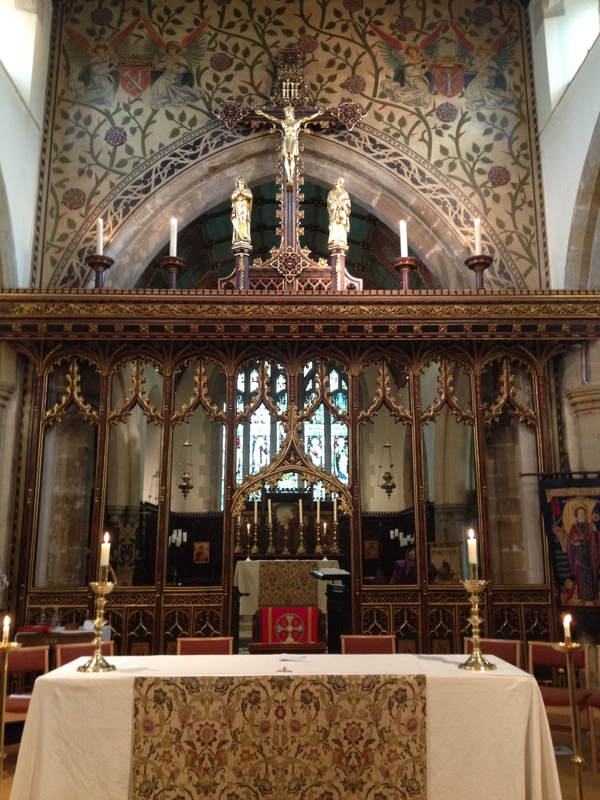 I have come to realise that when I visit a church I am curious about a few things; the welcome, the worship, the sermon, and the support or help offered. So, first of all I received a lovely welcome from Angela. As she handed me the booklet for this morning’s service, I asked her if that was all I needed. She realised as I asked that I was a visitor, and explained that everything was indeed in the booklet, and also gave me a leaflet introducing the church, inviting me to look around afterwards. I sat down and looked through the booklet to see if there was anything unusual, but it all seemed familiar. It was a fairly lengthy booklet, running to twenty-four pages, including information about an upcoming festival of music, other announcements, and contact information for the parish. Pages two, three and four were information to prepare for the service; mobile phones off, facilities in the church etc. I particularly liked the information on page four, on how to sit, be still and pray before the service started. The worship itself: as well as the vicar there was also an assistant priest, several servers and acolytes, and a choir of about twenty people. Quite a lot of the responses were sung, but the music was not provided for them or the hymns. I kept up but would have been able to do so far more easily if I had the music to sing from instead of the words only. There was incense, but not huge billowing clouds of the stuff, and the sermon was interesting enough. Thinking back to Evensong at St. Michael’s last week, I enjoyed the priest’s quiet, heartfelt reflections made without reference to notes more than this morning’s kind of standard sermon. But having said that, the priest this morning was preaching to a much bigger group of people and that clearly changes the dynamics. After the sermon and the Creed the booklet directed us to ‘sit or kneel’ for the prayers of intercession, and the congregation sat. I noticed that there were hardly any kneelers, but nevertheless, being accustomed to kneeling I knelt anyway. It was a little uncomfortable kneeling without a cushion but sitting doesn’t feel right to me. The Peace should follow directly after, but instead there followed ‘the presentation of chorister awards’ to some of the teenage members of the choir, which took about ten minutes. Following on from that, the Peace, and the two men behind me introduced themselves, ‘Kevin & Kevin’ and asked for my name. When I told them I was visiting but had attended a service last summer also they remarked,’You’re a regular, then!’ On to the offertory hymn, preceded in the booklet by a slightly stern reminder to use the gift aid envelopes so the church could claim back taxes and so increase the money given. This information had been included at the beginning of the booklet so I found it a little jarring to see it repeated in the middle of the service. Anyway, I’m not a UK taxpayer so I ignored it. The Eucharistic Prayer, and then we received communion. The choir went first, then went to the back of the church to sing while the rest of the congregation went up to the altar rail. The anthem they sang first was beautiful. The hymn they sang next, (“Oft in danger, oft in woe”) was not. Sung in four parts, the sopranos lost the melody line and the whole thing fell apart, I suppose without the melody the other parts couldn’t really hear where they were going. Anyway, a number of the choir members, particularly the younger ones, seemed to find this quite funny, and the choirmaster looked rather rueful. I can only imagine that it had been a bit hit-and-miss in rehearsal but they had decided to do it anyway and hope for the best, but it really was a bit dreadful. We stood for the prayer and then sat for announcements, particularly on the subject of the festival of music. After that, back on our feet for the blessing, and we prepared to sing the final hymn, when there was a kind of beeping noise, which gradually got louder. The vicar said it was the fire alarm and we all had to leave the church. As people started to stroll towards the main door, they found their way blocked by an elderly gentleman holding a large piece of paper on which someone had written FIRE in large red letters. We turned and strolled out of the back entrance instead, as we did passing a woman alternately telling us, ‘Assemble on the grass at the bottom of the hill,’ and ‘You can come back for coffee.’ We wandered outside, then stood about for a few minutes. I talked to Kevin & Kevin a little, then we all wandered back. Apparently the service had ended. I was a little disappointed, because the last hymn was to be ‘Great is thy faithfulness’, but there was neither that nor the organ voluntary. On my way out I picked up a copy of the parish news and noticed that there is a Julian Group meeting on the first Thursday of every month, which made me happy. Angela was still by the door and invited me to come again next year. I think I will, and if I lived in Brighton I would consider making St. Nicholas’ my regular church. It’s a friendly and welcoming place, and I enjoyed the service. However, I am left with two questions that I think need to be the subject of separate blog posts, because they are things which concern me. One is music: how much it enhances worship, and how much is ego. The other is about the accessibility of worship. I know my way around most services, so even if I am not familiar with the particular form of words or the musical setting I can find my way through it. However, neither this Sunday nor last did anyone check if I could do that, and I wonder how someone would feel if they were a complete newbie. How do we support someone who is completely new to the liturgy? How do we make worship more accessible? This entry was posted in Travel and tagged Brighton, Holy Eucharist, Julian Group, Julian of Norwich, St. Nicholas of Myra by tokyopurplegirl. Bookmark the permalink.